Welcome to Stilwell Joinery’s official website. Stilwell Joinery is a family run business located in south London. 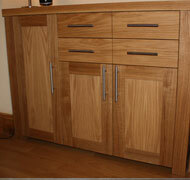 It is a highly skilled company with over forty years experience in purpose made joinery both commercial and domestic. Please feel free to browse our website and look at some of our recent work. Copyright © Stilwell Joinery 2012.